In fast bowling generally we do have two types of cutters one is the ball which cuts away from the batsman towards the slip region after moving off the pitch known as leg cutter. The other one is the ball which moves or cuts into the batsman after hitting the pitch in and around the off stump line known as the off cutter. Similarly to seam bowling the off and leg cutters generally happens when the ball actually hits the pitch or moves off the pitch. The cutters generally comes straightly before hitting the pitch, but after hitting the pitch they suddenly deviate or cut away from the batsman or into the batsman testing the batsman instantaneous ability to defend the ball. Just like in spin bowling where we use the word ‘break’ in leg breaks and off breaks, the word ‘cutter’ is used in off cutters and leg cutters with the similar concept in fast bowling. Generally in off spin bowling the word off break is used because the ball actually breaks the in and around the off stump line after hitting the deck and moves suddenly into the batsman. Similarly in fast bowling the word off cutter is used because the ball actually comes straighter in and around the off stump line before hitting the pitch and then suddenly cuts from the off stump line after hitting the pitch and moves into the batsman. Since the ball cuts into the batsman suddenly after hitting the pitch in and around the off stump line it is called as off cutter. Similarly in leg spin bowling the word leg break is used because the ball actually breaks the in around the leg stump line after hitting the deck and moves suddenly away from the batsman. Similarly in fast bowling the word leg cutter is used because the ball actually comes straighter in and around the middle and leg stump line before hitting the pitch and then suddenly cuts from the leg stump line after hitting the pitch and moves away from the batsman. Since the ball cuts away from the batsman suddenly after hitting the pitch in and around the middle and leg stump line it is called as leg cutter. Remember the concept of off and leg cutters are completely different from swing bowling and seam bowling. So when the ball is new it is very difficult for the bowler to cut the ball into the batsman or away from the batsman since the off cutters and leg cutters generally depend on rough, hard leather parts or sides of the ball in fact depends on old or odd balls. Therefore when the ball is old the off cutters and leg cutters depend on rough side or leather part of the ball, seam position, seamy part of the ball, nature of the pitch, climatic conditions, how do you hold the ball and wrist position. 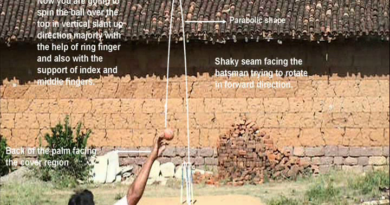 The position of seam of the ball is always the reference point in any type of fast bowling. HOW DO YOU BOWL OFF CUTTERS AND LEG CUTTERS ? The first and fore most basic thing to cut the ball into the batsman or away from the batsman is “the ball has to be old with at least one side of the ball having rough, hard leather area “. If both sides of the ball are rough and hard it’s well and good. 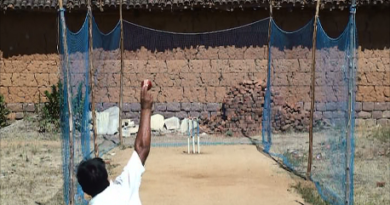 In any type of bowling may be fast bowling or spin bowling gripping the ball is always the key factor. So to cut the ball into the batsman grip the old ball with the seam up or seam facing towards middle and leg stump or leg slip region such that right side of the ball is rough and hard. Similarly to cut the ball away from the batsman grip the ball with the seam up or seam facing towards 1st slip region such that left side of the ball is rough and hard. Grip the ball with the seam up in such a manner that the fingers index and middle are slightly separated or closely together rested on seamy part of the ball completely from tip of the fingers to the other end with the joints. Now to cut the ball into the batsman the finger index is rested on centre right part of the seam in fact the index finger is slightly rested on centre part of the seam and right part of the seam, the finger middle is slightly rested on right part of the seam and rough side (right) of the ball or rough leather part (right) of the ball with the help of steady and firm wrist. 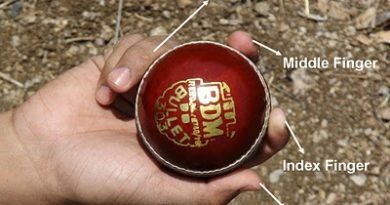 Similarly to cut the ball away from the batsman the finger middle is rested on centre left part of the seam in fact the middle finger is slightly rested on centre part of the seam and left part of the seam, the finger index is slightly rested on left part of the seam and rough side (left) of the ball or rough leather part (left) of the ball with the help of study and firm wrist. Now to cut the ball into the batsman run or roll or drag your index and middle fingers completely down on right side of the ball or rough side (right) of the ball or rough leather part (right) of the ball or outside the ball from top position. The better you roll or run your fingers on rough right side of the ball the better it cuts into the batsman after pitching. Similarly to cut the ball away from the batsman run or roll or drag your index and middle fingers completely down on left side of the ball or rough side (left) of the ball or rough leather part (left) of the ball or inside the ball from top position. The better you roll or run your fingers on rough left side of the ball the better it cuts away from the batsman after pitching. So when the ball is new this is the main reason where you can’t run or roll your fingers down on the shiny side of the ball. In fact the fingers might skid on shiny side of the ball even if you try to roll it or run it. So to roll or run your fingers at least one side of the ball has to be rough and hard. And that’s why we can’t bowl off cutters and leg cutters when the ball is new. For off cutters grip the ball in such a manner the fingers index and middle are slightly separated or closely together rested completely across the seam slightly which is facing towards middle and leg stump or leg slip region. The finger index is completely rested on centre and left part of the seam. And the middle finger is completely rested on right part of the seam and on rough right leather side of the ball. 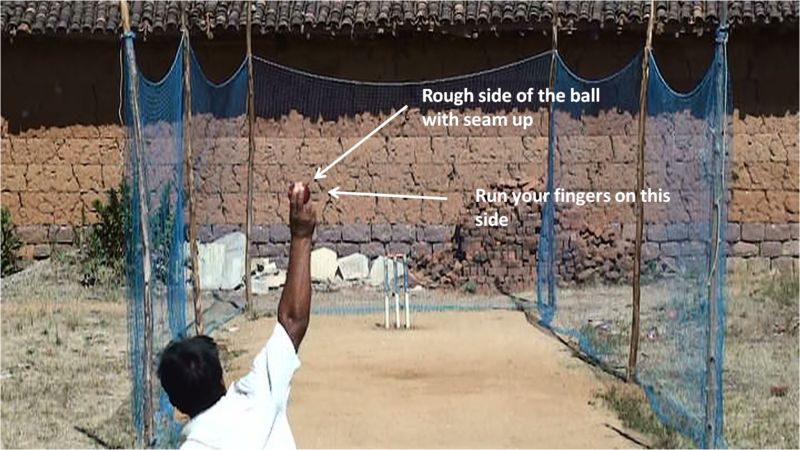 Remember here the position of seam of the ball should face towards leg stump or middle stump with the help of index and middle fingers and also with the support from steady, straight and firm wrist. Similarly for leg cutters grip the ball in such a manner the fingers index and middle are slightly separated from each other or closely together rested completely across the seam slightly which is facing towards 1st slip region. The finger index is completely rested on left part of the seam and on rough left leather side of the ball. And the middle finger is completely rested on centre and right part of the seam. Now for off cutters roll or run your index and middle fingers completely down on rough right side of the ball. And for leg cutters roll or run your fingers completely down on rough left side of the ball.